To watch a Sofia Coppola film is to be transported to an alternate universe, defined by her fondness for soft, natural lighting, meandering, drawn-out shots, and, most notably of all, sumptuous pastel hues. But while there’s no denying that her films look good enough to eat, there’s more to the American director’s distinct aesthetic than first meets the eye, her films’ visual codes serving to reflect the emotional journeys of her protagonists. As video essayist Jacob T. Swinney points out, “Coppola’s atmosphere seems to mirror the inner workings of her characters. [She] crafts these dreamscapes to show us not only who her characters are, but who they want to be.” Next week marks the UK release of her anticipated sixth feature, The Beguiled, a feminist psychodrama based on Thomas P. Cullinan’s novel of the same title, starring Colin Farrell, Nicole Kidman, Kirsten Dunst and Elle Fanning. 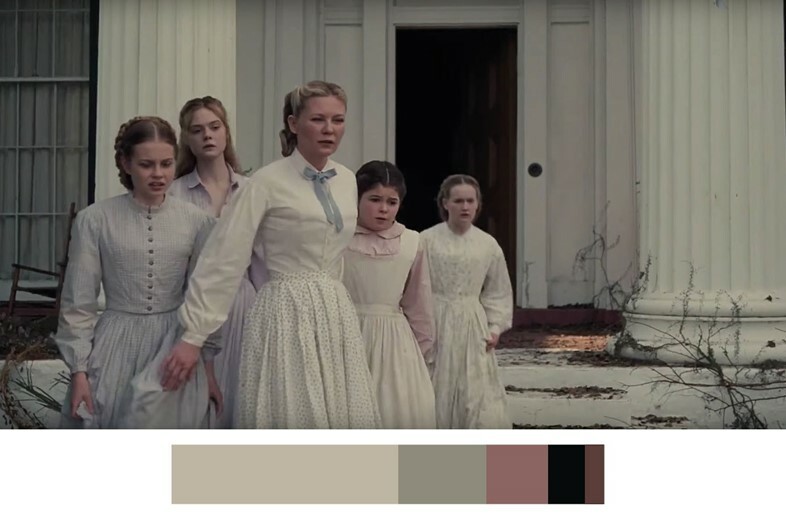 Here, in celebration of its impending arrival, we decode the sumptuous colour palettes of Coppola’s impeccable back catalogue. Coppola set the visual bar high with her debut feature adapted from Jeffrey Eugenides’ mesmerising tale of teenage repression and desire in 1970s Detroit. At the film’s centre are the five Lisbon sisters – otherworldly, blonde-haired, prairie-dressed, and stifled by their overbearing, God-fearing parents. Drawing inspiration from the washed-out tones of Peter Weir’s visually arresting drama Picnic at Hanging Rock, and the hazy iridescent quality of 70s Polaroids, Coppola manages to evoke both the girls’ fragile innocence and burgeoning melancholy, as well as the heady lust of the neighbourhood boys through whose eyes the story is told. 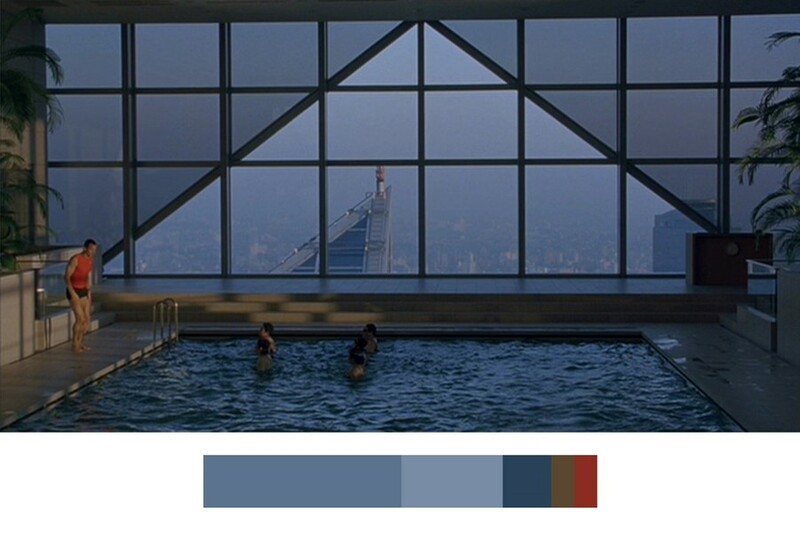 For her 2003 masterpiece Lost in Translation, Coppola embraced a less ethereal colour scheme. 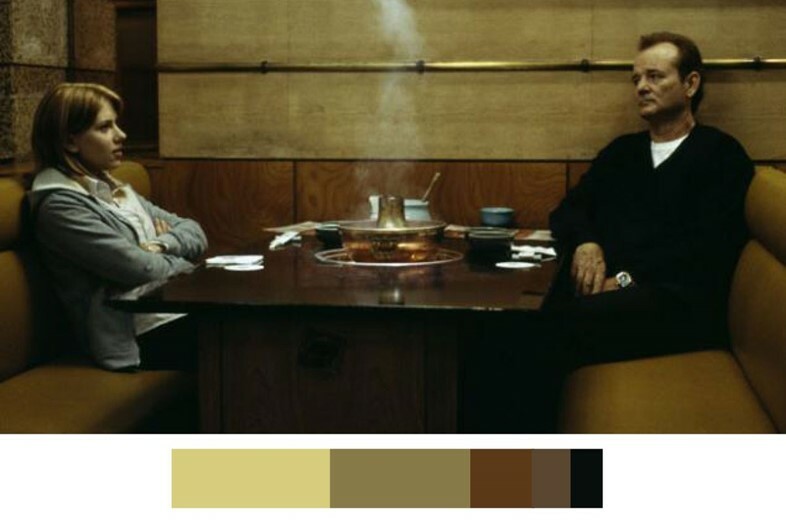 Muted, earthy hues denote the lacklustre spirits of Bill Murray’s Bob Harris, an ageing movie star whose career is on the decline, and Scarlett Johansson's Charlotte, a neglected newlywed, when they meet in a Tokyo hotel. But as their friendship blossoms, and they restore in each other a sense of hope and purpose, the vibrant colours of the luminescent Japanese capital begin to take hold. The director’s languid 2010 movie Somewhere paints an exquisitely coloured portrait of a newly famous, yet disenchanted, Hollywood actor: renowned bad-boy Johnny Marco, played by Stephen Dorff. While he recuperates from a minor injury at the Chateau Marmont in Beverly Hills, the desolate star’s spiral of self-destruction is interrupted by the arrival of his young daughter Cleo (Elle Fanning), prompting an enforced period of self-reflection. 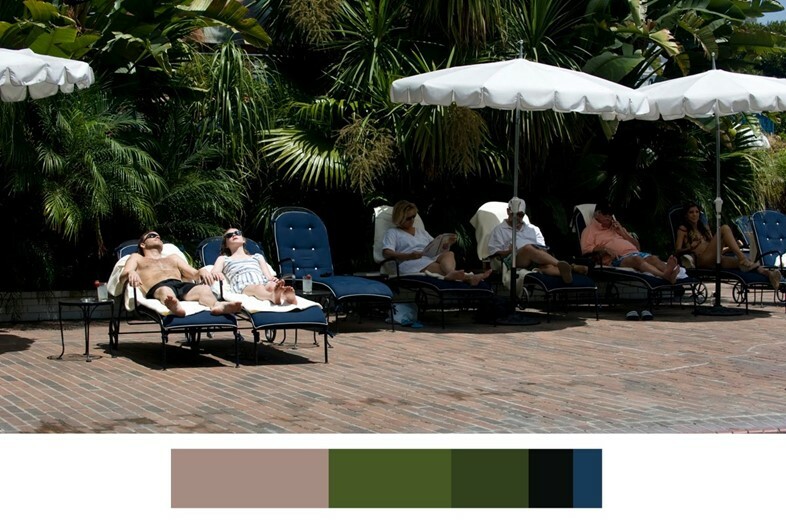 Bleak greys, mauves and blacks accompany Marco’s bouts of depression, while David Hockney-esque shades of pink, green and swimming pool blue lend his LA environs a meretricious quality symbolic of the shallowness of his seemingly picture perfect lifestyle. 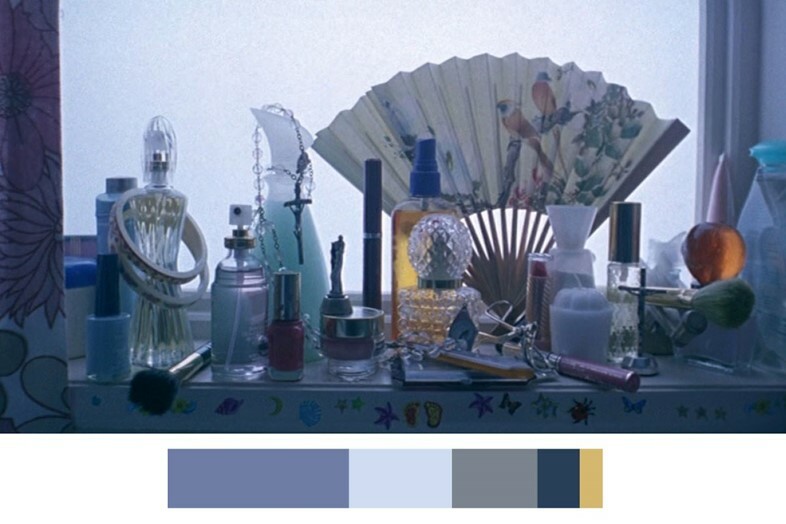 As its title might suggest The Bling Ring boasts the most garish palette of all Coppola’s films. It tells the real life story of a group of celebrity-obsessed teenagers who break into the houses of their idols to while away their teenage boredom, stealing flashy trophies of their conquests – from clothes and bags to jewellery and cash – along the way. Their favourite looting spot is Paris Hilton’s LA mansion, which resembles a lavish nightclub, punctuated by neon lights, gold detailing and shocking pink decor. In the bandits’ own homes, transversely, neutral beiges abound – in comparison to the glitzy strata they seek to inhabit, real life is distinctly vanilla. Coppola’s latest follows wounded Civil War soldier (Farrell) as he arrives at an all-girls boarding school in the American south, seeking aid and shelter. Fraught sexual tension and extreme rivalry ensues, enshrouded in a seductive, sepia-toned atmosphere only Coppola can cultivate. The film is awash with candy-coloured pastels courtesy of the girls’ satin evening dresses and the school’s dusty hued interiors, while the emergence of Farrell’s alluring officer in the surrounding forest is heralded by virile greens and lustful crimsons. Both visually and narratively, The Beguiled casts a powerful spell. The Beguiled is in cinemas nationwide from June 23, 2017.